Specially formulated high molecular weight connector gel used as a dielectric compound and as a corrosion protectant. Provides much better protection than typical grease, due to the special additive package. The thin 00 viscosity of the product makes it easy to coat and prepare a barrier of protection that will outlast conventional grease. Not to be used in place of a regular grease as it does not contain the extreme pressure additives necessary to hold up in a bearing or under load. However, due to its high dielectric strength, it is effective as a dielectric compound and corrosion inhibitor in plugs and connectors, electrical terminals, electrical fittings, spark plugs and coil connectors. Superior oxidation barrier and employs no soaps, salts or metal based gellants. It remains pliable, will not harden or crack and resists change due to mechanical working. Quality control measures insure maximum storage life and no oil separation of the compound. 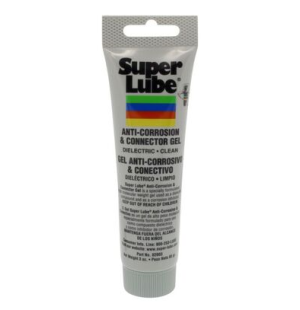 Demonstrates excellent film strength and long life protection against corrosion, rust, friction and wear. Max temp range from -40F to +500F. Resistant to saltwater and most detergents. Won't dry out or form harmful abrasive deposits. 3 oz tube.